An online rental scam appears to the source of confusion that led to the contents of someone's home being unloaded in the driveway of an unsuspecting Ottawa homeowner in the middle of the night. 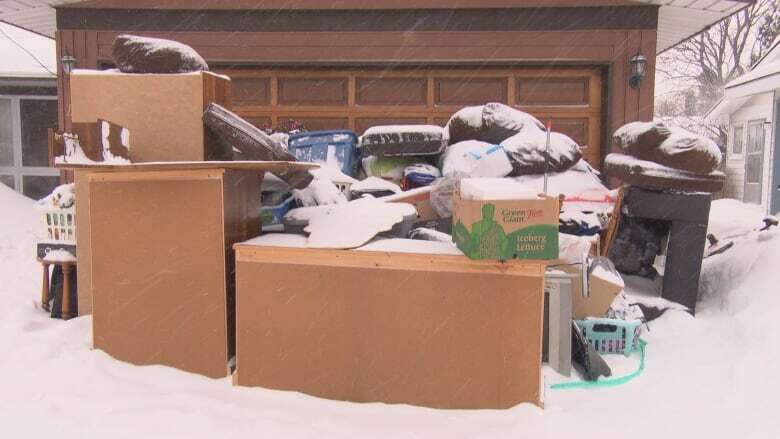 An online rental scam appears to be what led to the contents of someone's home being unloaded in the driveway of an unsuspecting Ottawa homeowner in the middle of the night. Kit Pullen woke up this morning thinking he'd have to shovel some snow from his driveway. But that wasn't all he found. At some point in the night, a U-Haul truck pulled up to his Ottawa home on Parkglen Drive and two men unloaded everything inside it. The big pile, taller than Pullen, was left right in front of the garage door, trapping the family car inside. "It looks like it's the contents of somebody's house or apartment, dumped here at four o'clock this morning by somebody in a U-Haul truck," Pullen said Wednesday morning. "Fortunately, we don't need the car this morning." Nikki Wilson told CBC News in a text message that she posted an ad on Kijiji searching for a new home in Ottawa as she planned for a move from Napanee, Ont. She said she didn't realize the couple who responded to her ad had caught her in a "scam" until it was too late. "I just wanted a new start, a place to finally call home and make my own life with my family," she wrote. "How can people be so cruel in this world." "By the time we were heading home, that's when she messaged back and said, 'You dropped off the stuff at the wrong place. It was a scam,'" he said. On Wednesday afternoon, he returned to Parkglen Drive to pick up the load and to bring it back to Napanee. "It's just unfortunate," he said. "I want to make sure that everything is OK. I want her to have her stuff back."